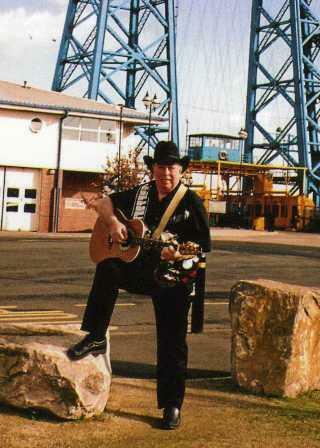 Eric White is the Original Teesside Cowboy, formerly a member of Mike Kemp's Blue Caps band with Mike Kemp and Tony Martin, a Top Northern Beatgroup popular in the late fifties and sixties in Dancehalls, Clubs and Theatres in and around the North East of England. The band supported stars such as Brenda Lee, Rod Stewart, Elton John, Vince Hill, Long John Baldry, Chris Farlow, Alan Price, Frankie Vaughan, The Animals, Billy J Kramer, Emile Ford and Paul Daniels to name but a few. The last forty years has seen Eric develop his own solo career on the North East and National Club circuits. For many years Eric ventured into the Country Music scene, but has recently teamed up with his old buddy Tony Martin performing their tributes to the 50s, 60s, Rock n Roll Nostalgia Nights at their 'Zimmer Frame Ball Tour' starting early September, only a few dates left, so book them in your venue soon !